The site pump, with Operatives. Again some recognisable employees, this time as acting Firemen. Did they get a bonus for being on standby? Was the pump ever used in anger? If you know the people in this photograph, or know more about the subject, please add your comments, by clicking on Add a comment about this page below. 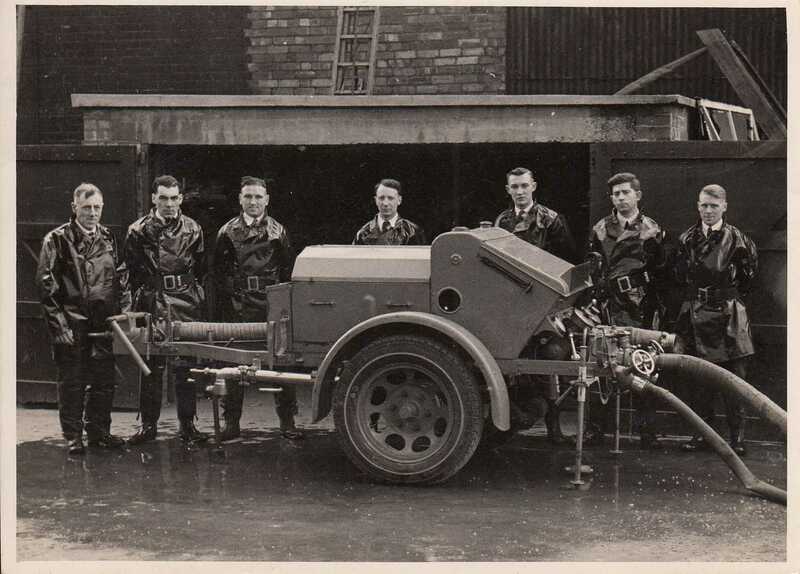 In the fire brigade photograph the person extreme right is my father Bill Hickman. He left Fieldings in 1950 so the photo is most likely from the late 1940’s. He is standing next to Jack Hobbs.Third from the left is Jim Haines. The gentleman in the centre is my grandfather, Amos Jones, but I believe known as Arthur at work. I always knew he acted as a part-time factory fireman during the war but a lovely surprise to see a picture of him. I have also found pictures of my father, David Cohen, and uncle, Ted Cohen, in the rugby team and apprentice photos. Great website, great history! A couple of weeks ago, Derek Tidmarsh and I, interviewed Andy and Felicity Fowler. Their memories will appear on their page, however after we had finished the recording, Andy recalled a memory of the F&P Fire Brigade in action. It seems that there was a fire in the roof of the fabrication shop, so the brigade sprang into action. To get the pump to the fire, the quickest way was down the slope past the offices in Hydraulic one and out to the Black Road. It was the city fire engine!!!! Hi Alistair! Could it be Arthur Jones in the middle? I know what you mean about recognising other faces, but yes, we are/were probably too young. Wish I still was Alistair, and yes, the pension is being drawn as of end of April last year! Chippy Aston. Jim Haines…3rd from the left. Thanks Graham. A young Jack Hobbs is second from the right. I recognise others too, but you and I are slightly too young to know them I think, even though you must be drawing your pension too by now! Alistair. Hi Alistair. As you say, recognisable faces, but I am having difficulty putting names to them myself. I remember seeing this pump in Hyd 2 in about 1980. It had been brought out of the ‘fire shed’ on the ‘church yard’ when that area was being cleared and the old church crypts demolished. Myself and Dave Tucker made some enquiries as to whether we could have/purchase the pump and restore it to working order, but we learnt that it was going to someone else, for restoration or scrap we never found out. I can only hope it was for the first reason as it would have been a great shame if it had gone for scrap! Chippy Aston.